We began our eagle-watching weekend on Friday night at the Lodge in Pere Marquette State Park, an ideal place to use as a base. Open all year. Reservations: call 618-786-2331, or www.PMLodge.net .Their slogan is “Come and stay, the natural way”. Pere Marquette Lodge and Conference Center, a few miles north of Grafton on Highway 100—the Great River Road—is on the edge of the state park by the same name. The 8000-acre park is set in the rolling bluffs and woods overlooking the scenic Illinois River. Pere Marquette State Park was founded in 1932 under the name “Piasa Bluffs State Park’ (named for the legendary Piasa Bird, see later). The original purchase of 2,605 acres was made for $25,000, through a combination of local donations and state matching funds. By popular appeal, the name was changed to Pere Marquette State Park, reflecting Father Marquette’s connection with the early history of the area. Today the park encompasses 8,050 acres. Father Jacques Marquette (the French Jesuit missionary-priest who came to North America to share his faith with the native people), with explorer-cartographer Louis Joliet, was the first European to enter what is now Illinois in 1673, where they met members of the Illini tribe. They were paddling down the Mississippi River on an expedition commissioned by the Governor of New France, trying to find a passage to the Pacific Ocean. When the local people told them that this river emptied in the Gulf of Mexico, they turned back and went along the Illinois River, stopping at a point near what is now the state park. A large dolomite stone cross commemorates this landing close to the confluence of the Illinois and Mississippi Rivers. But, the history of the park is much older than this. Throughout the hills, ravines, woods, and prairies of the fertile area along the Illinois River, Native American people hunted game, gathered food, and later made houses. Archeologists describe 6 Native American cultures from this region and have found fragments of pottery, spear points and planting tools. About 150 burial mounds are distributed throughout the park, most still unexcavated. A fascinating legend still survives from these early days. Early people painted 2 huge pictures on one of the bluffs of a creature called Piasa—part bird, with the face of a man, scales like a fish, horns like a deer and a long black tail. Marquette and Joliet saw these and were initially afraid. What was this creature and what was its significance? Supposedly it preyed on local Indian tribes, until it was killed by Illini Chieftain Owatoga, whose village was near Elsah. The original Bluff Picture was painted so Indians, passing on the river, could shoot poisoned arrows at the “Bird”, in memory of their deliverance. A modern painted Piasa Bird is maintained to this day on the bluffs about 20 miles south of the park close to Alton. The Lodge was originally built by the CCC (Civilian Conservation Corps) from 1933-1939, supposedly over a Native American village site. It opened for business in 1940 and was dedicated in 1941. The cost of construction was $352,912.00. Timbers of Douglas fir and western cedar from Oregon were used, along with limestone from the Grafton Quarry. Recent expansions and renovations blend in with the native stone and rustic timbers of the original. The massive lodge building has 50 guest rooms, an indoor pool, game room, a restaurant open for breakfast, lunch and dinner, the Mary Michelle Winery/bar, and gift shop. especially at sunrise and sunset. This is also a favored venue for weddings—and we watched one the Saturday evening we were there. The lodge also offers 22 stone guest cabin rooms, in 7 cabins, a short walk from the main building. The Lodge overlooks the Illinois River and is just a short walk from the Pere Marquette Visitor Center, which has a lot of useful information about the park’s fauna and flora, the history of the area, and bald eagles. —The term “bald” refers to the old English word “balde” meaning ‘white’, rather than ‘without feathers’. Adult birds (4-5 years old) have a distinctive white head and tail, and dark brown bodies. —Young birds vary in color from solid dark brown to mottled brown and white plumage. —Adult beaks and eyes are bright yellow. The hooked beaks are used for tearing flesh. —Eyesight is very keen, up to 5 times better than human vision. They can see a rabbit about two miles away, for example. They have both monocular and binocular vision. —eagles are one of the largest birds of prey in the world; they are 3 to 3.5 feet tall, with a 6.5 to 8-foot wingspan. —Eagles mate for life and usually go back to the same nest, which they keep adding to. Some nests end up around 10ft wide, weighing hundreds of pounds. —Females weigh up to 15lbs, males 8.5-9lbs. —They eat fish mainly, but sometimes also eat ducks and geese. They can also be scavengers on dead or injured wildlife, such as ducks or deer, especially in winter. They also pirate food from other eagles or other birds. —Their powerful 2-inch talons are used to take prey. —They lay 1-3 eggs, which take 35 days to hatch. In 75 days the eaglet is almost full grown and ready to fly. —The main predator is the raccoon, which takes eagle eggs. —Eagles fly 20-40 mph in normal flight, but can reach speeds of 100 mph while diving. They can fly up to 300 miles per day when migrating!! —The average age is about 15 years, but they can live up to 30 years in the wild, and to 50 years in captivity. During the Bald Eagle Days festival in Alton, Illinois, you can even pat a costumed eagle! Our little car is rather dwarfed! It’s Earth Day today (April 22)—the 45th anniversary of the start of Earth Day. Many groups and organizations are making a plea to the public to be aware of the environment and our earth and to think of ways to help it. Even Pope Francis gave an address today. To honor the occasion, World Wildlife Fund is asking people to Hug A Tree, and send in pictures of the tree huggers, as a way to stand up for forests and to appreciate them more deeply. Taking care of our forests is certainly critical to taking care of the environment, so in that spirit I’m re-posting a previous article on the wonderful redwoods in northern California—where we hugged many trees! One August a few years ago, my husband had a conference in Berkeley. After the time in Berkeley, we had 8 free days and decided to explore parts of northern California. We visited little-known wineries, Lassen Volcanic National Park…and the amazing redwoods, which is what I’ll focus on here. We rented a car from SFO International Airport (easy to get there on the BART) and set off north on Highway 1 over the iconic Golden Gate Bridge and on highway 101 to the town of Willits, our night stop (at Old West Inn, and dinner at Al’s Redwood Room, with reasonably priced Thai-American food). 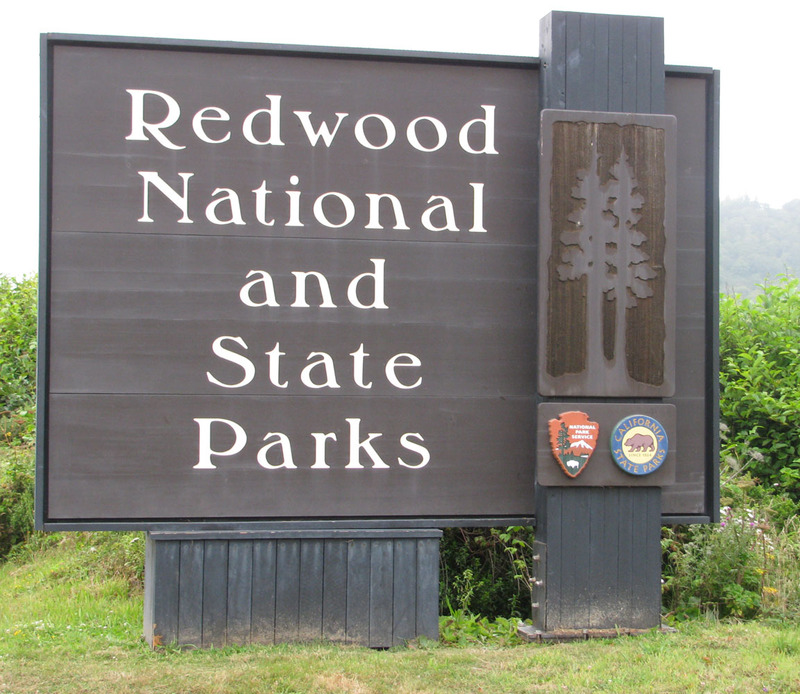 It prides itself on being the Gateway to the Redwoods, which it is. Next day we continued north on 101 to Arcata, just north of Eureka, where we spent 2 nights as our base to the famous redwoods (in the Quality Inn, just off the highway). 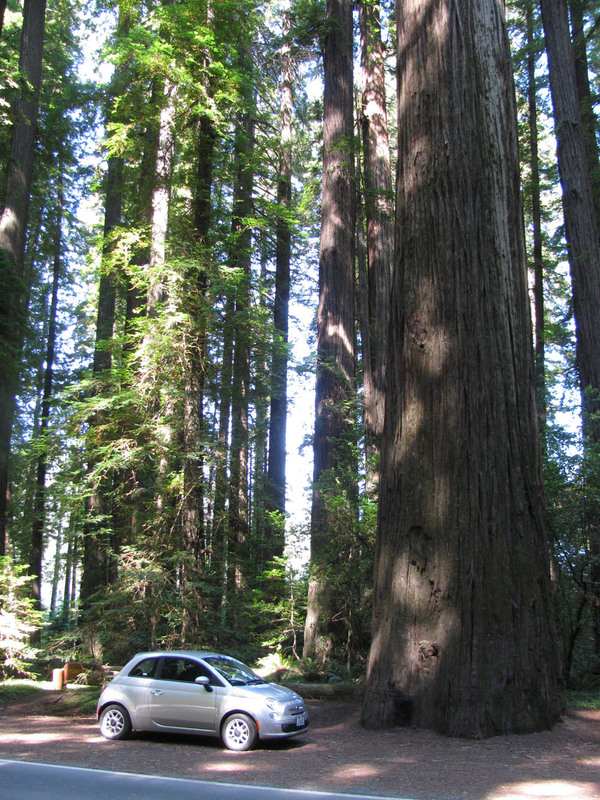 We hadn’t realized until we began this drive that one of the best places to see the magnificent redwoods is in Humboldt State Park, along the Avenue of the Giants, as it’s known. 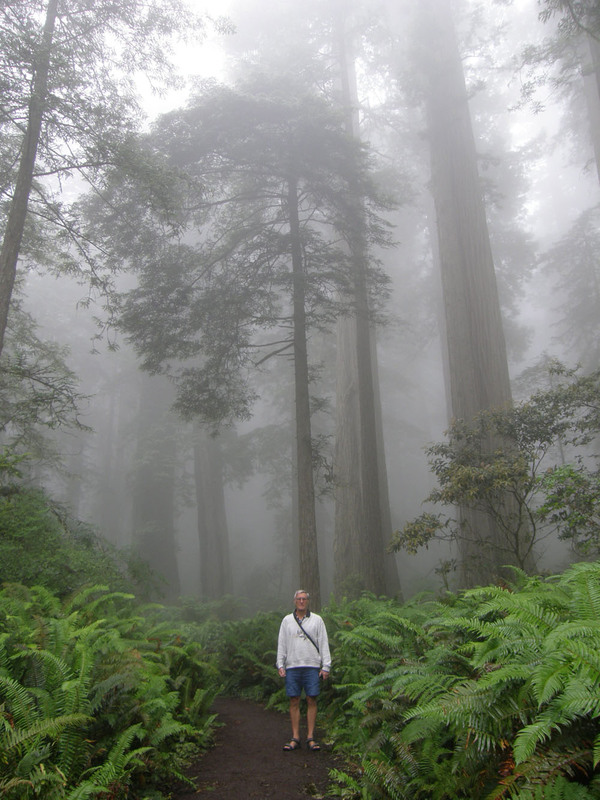 The number and size of redwoods here equals that in the Redwood National Park farther north. We left the highway at Phillipsville, between Willits and Arcata, and slowly savored the next 31 miles of the Avenue of the Giants, the old redwood highway, which winds through the groves of trees, the road sometimes so narrow there’s only room for one car and you feel as though you could stretch your arm out the window and touch one of the giants. Luckily, there are numerous stopping points and a couple of short walks where you can get out and actually touch, or hug, a tree if you wish. These trees are amazing, so big and so beautiful that they inspire wonder and it’s hard to find the right words to adequately describe them and the effect they have on the awe-struck visitors. 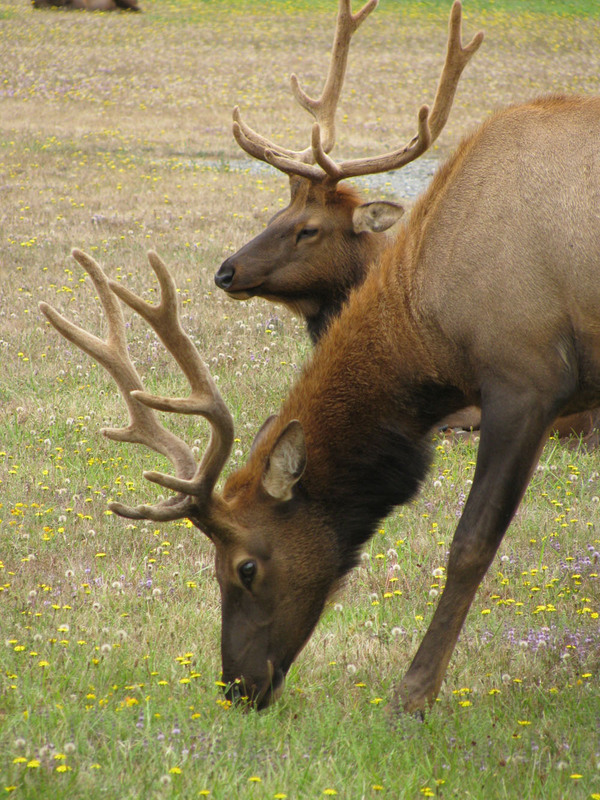 The next day we drove a little north of Arcata to the Redwood National Park, another delightful spot, for redwoods and also for viewing Roosevelt Elk (which we saw in abundance). A must-do is the one-mile loop Lady Bird Johnson Grove Nature Trail, which also has an illustrated explanatory booklet. It winds through old-growth redwood forest and is a reminder of the extensive redwood forests that once covered the Pacific coast from Big Sur to southern Oregon. We learned how intensive logging has reduced the forests drastically, and became stimulated to support efforts to conserve and preserve these giants, many thousands of years old. The day we were there, the grove was wreathed in a thick coastal fog, creating a truly mysterious, almost magical, feel, as the great, grey shapes appeared and disappeared. There are no places to buy food in the park itself, but the little hamlet of Orick has a couple of cafes serving good diner-type food. 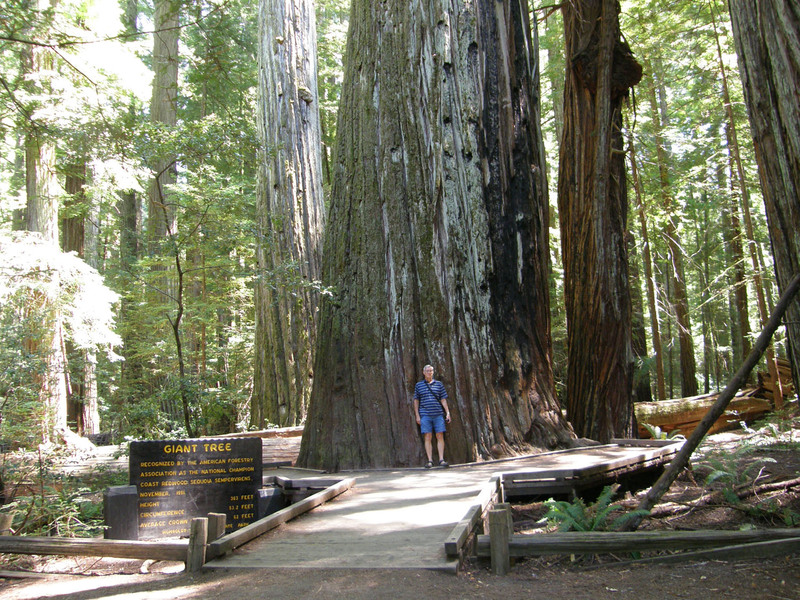 Back in the park, it’s also well worthwhile to drive along the Newton Scenic Parkway (the old redwood highway) to gaze and wonder again at these timeless giants, with a stop at the Big Tree Wayside. A short walk took us to the Big Tree, supposedly one of the most massive redwoods, with a height of 300+ feet and a 21-foot diameter. (To be honest, we felt we’d already seen bigger trees). 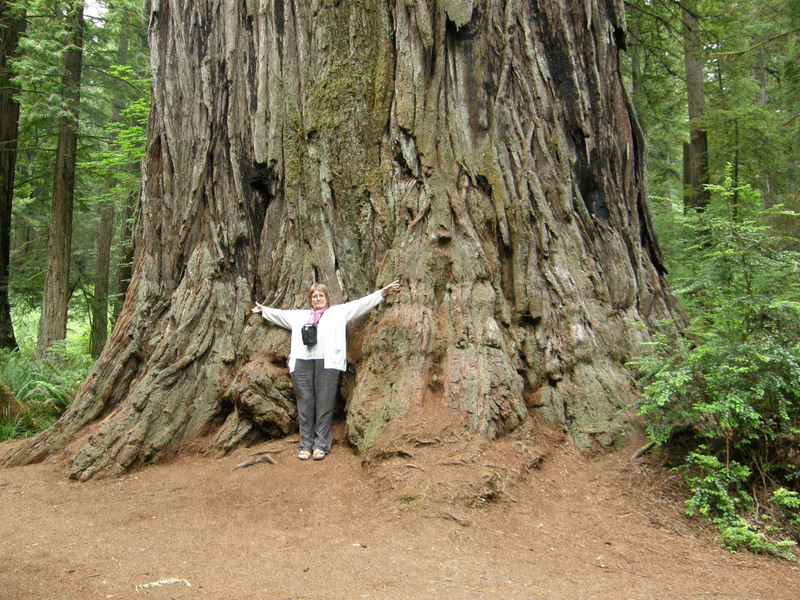 The 2 days walking amongst redwoods passed very quickly, but gave us a good introduction to these beautiful giants. Take a look at my earlier article on Earth Day and its origins (written 5 years ago to celebrate Earth Day’s 40th year).